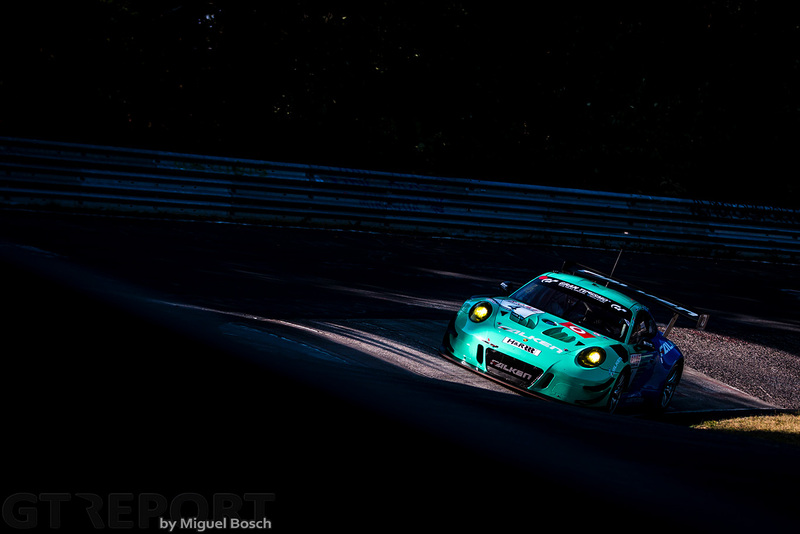 For seven years Falken Motorsports has been trying to get its Porsche onto the top-step of the Nürburgring podium, coming close so often but eventually always flanking the winner. 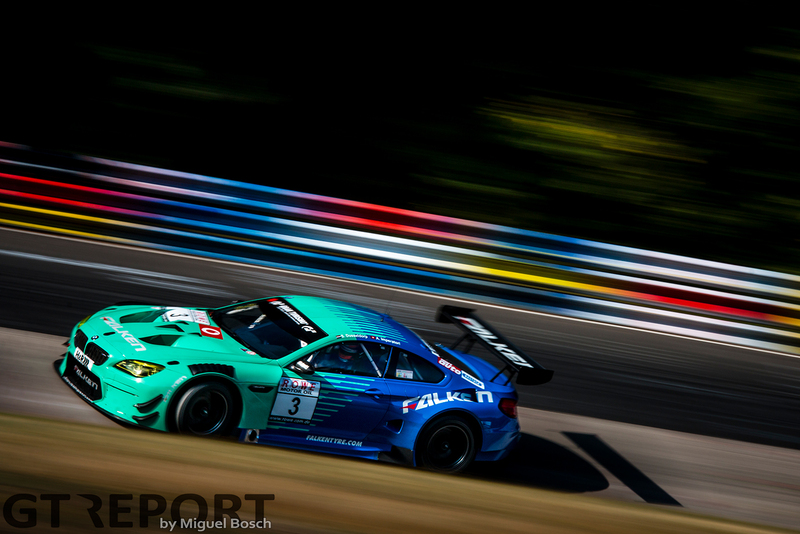 It wasn’t until just last year when BMW M6 GT3 racers Stef Dusseldorp and Jörg Müller finally brought Falken Motorsports its very first victory after 18 years of trying. In the 41. 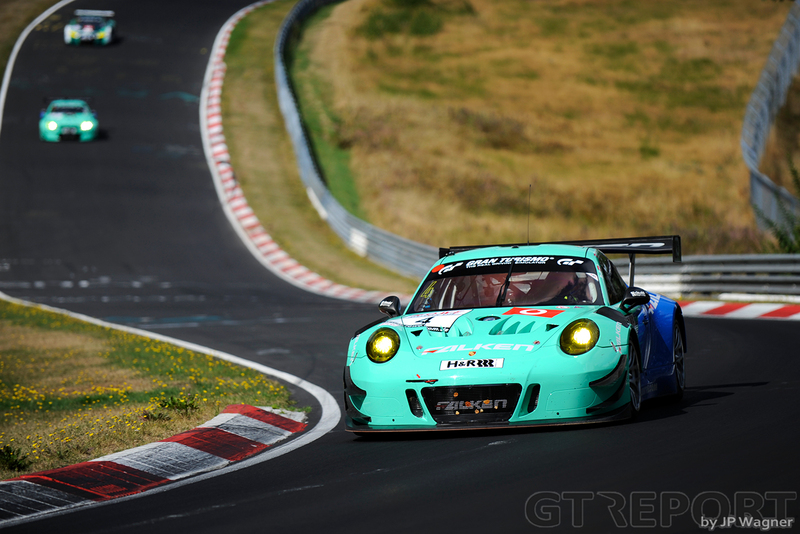 RCM DMV Grenzlandrennen it’s the the turquoise Porsche 991 GT3R’s turn to claim victory as Klaus Bachler and Martin Ragginger take that long-awaited maiden win for the Porsche crew. Making it truly a day to remember, Stef Dusseldorp and Alexandre Imperatori finish second to make it a Falken one-two. Nordschleife newcomer David Pittard shocks everyone when in the morning qualification session he put his Walkenhorst Motorsport BMW M6 GT3 on pole position with a time of 7:57.491 in just his third VLN weekend with a GT3, relegating Martin Ragginger in the Falken Motorsports Porsche 991 GT3R to the outside of the front row. 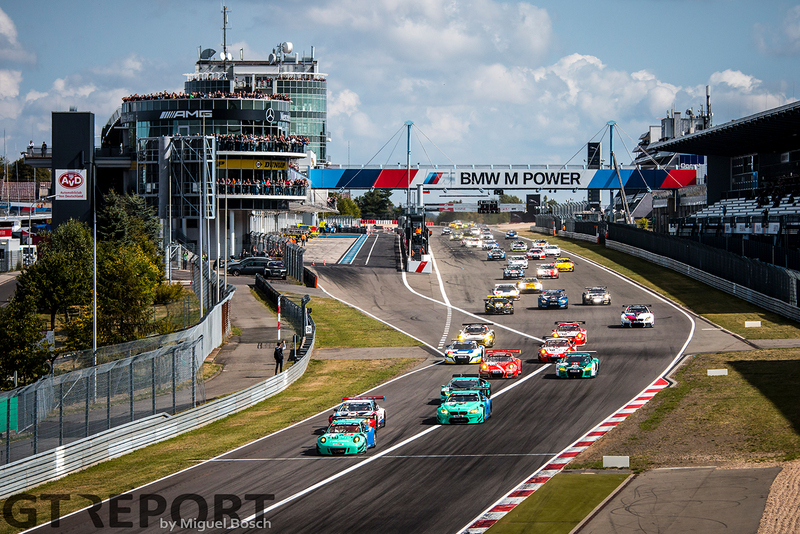 The burgeoning BMW team sees an opportunity to end its summer of success with a victory at the Nürburgring, but Ragginer’s team-mate Klaus Bachler has other plans for the start of the race. 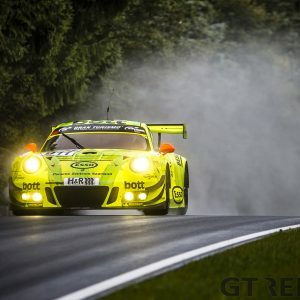 The Austrian is away quicker and aggressively brings the Falken Porsche back on top. With a determined move into turn one, Alexandre Imperatori puts his Falken Motorsports BMW M6 GT3 alongside Pittard’s and follows his Porsche team-mate onto the Nordschleife in second place. In the laps that follow, Pittard drops down the order, fighting to survive while his tyres’ grip fades away. What started out so promising this morning, ends in the second hour with an engine failure. Away from the battle zone and with clear track ahead of him, Bachler puts some distance between himself and the rest of the field. 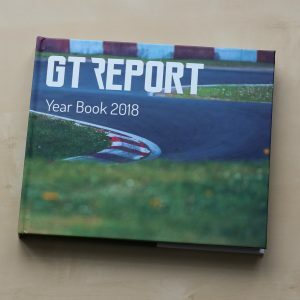 In the opening hour, the Austrian creates a sufficient gap to the Porsche’s pursuers to allow Ragginger to stay ahead after the first round of pitstops, despite staying out a lap longer than the rest of the frontrunners and therefor having more time added to their minimum pitstop time. 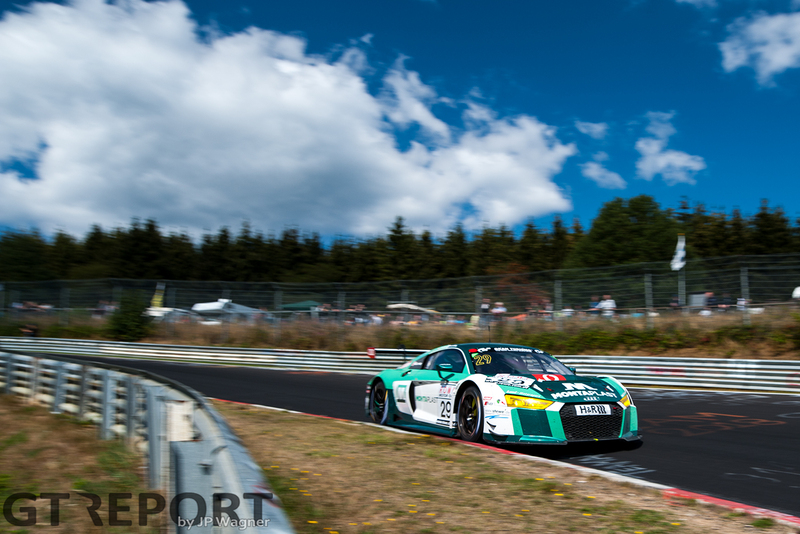 With Falken BMW team-mate Stef Dusseldorp and Land Motorsport Audi R8 LMS GT3 pilot Sheldon Van Der Linde now right behind Ragginger, the second hour sees the trio slice and dice through the Nürburgring traffic, chasing each other over the 24 kilometre long Eifel course. 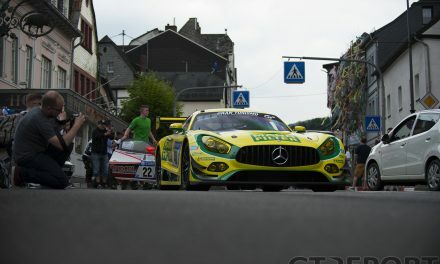 At the end of lap 10, Van Der Linde strikes as he slipstreams past the two Falken cars at Döttinger Höhe and moves into the lead. After two hours of racing, Dusseldorp is the first of the leaders to make his mid-race pitstop, coming in from third place to hand the car over to Imperatori for his second stint. Van Der Linde won’t get to his second pitstop: in what would’ve been his in-lap and the beginning of co-driver Jeffrey Schmidt’s drive, the Land Audi suffers a puncture and is eliminated from the race. Ragginger has left the stricken Land Audi behind and as it comes to a halt on Döttinger Höhe, Ragginger dives into the pits. Imperatori, back in the race and pushing to leapfrog the Falken Porsche during its second-to-last pitstop, has his plan shattered when double yellows are waved for the parked Land Audi. Forced to slowdown to the prescribed 120 kilometre per hour—150 kilometre per hour slower than the usual top speed on the long straight between Galgenkopf and Tiergarten—he loses out: Bachler exits the pits seconds in front of him. After Land Motorsport’s retirement, the race is Falken Motorsports’, and it’s up to the Porsche and BMW squads to decide which brand will fly the Falken flag in victory. Although Bachler has the upper hand at the start of the third stint, Imperatori only trails a handful of seconds behind his team-mate and is dead set on making up for lost ground. Knowing his Falken BMW will be forced to stand still in the pits longer during the final round of pitstops as his team will make its final pitstop one lap earlier than the Porsche, Imperatori closes the gap and takes the lead. Bachler, however, never lets his team-mate get out of sight. Controlling the gap, he loses no more than 6 seconds to the BMW. 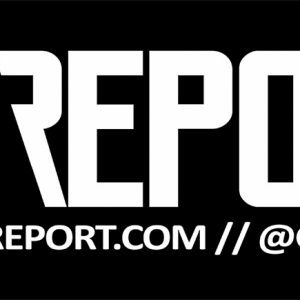 With that tiny margin Imperatori makes his last stop of the day and lets Dusseldorp take it to the flag. When on the next lap Ragginger takes over from Bachler and goes back out for the final 39 minutes, he leapfrogs the BMW by 6 seconds. Even now in second, Dusseldorp pushes forward. 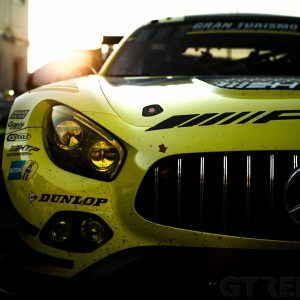 The Schnable Engineering-run team isn’t interested in enforcing team-orders. Dusseldorp chips away at Ragginger’s lead, but it’s to no avail: the Porsche has too much speed left in it. It allows Ragginger to stand his ground until the chequered flag is waved for the Falken Porsche—always the bridesmaid, finally the bride. Dusseldorp and Imperatori finish second to make it a historic Falken double. 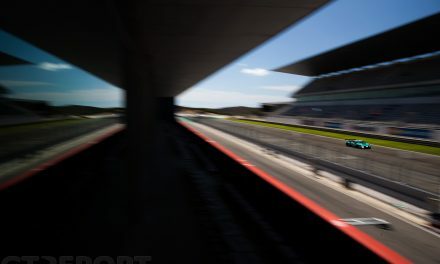 The stronghold of the Falken team is underlined by Klaus Bachler’s record-breaking race lap of 7:56.259, and another sub-8-minute lap shortly before the final pitstop of the race. Imperatori, too, manages to dive underneath the 8-minute mark on the blistering second race lap that saw several cars join the Falkens under 8 minutes. 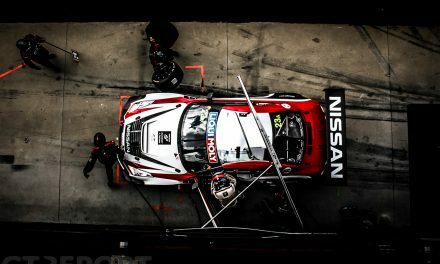 Konrad Motorsport takes third. 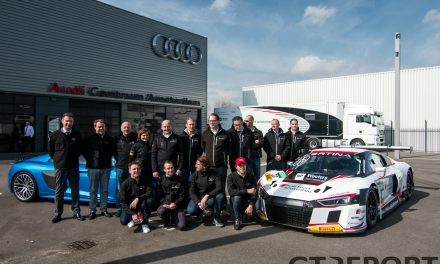 After a spring and summer of struggles with the Lamborghini Huracán GT3, Michele Di Martino and Christopher Brück lift the curse in a race that sees them steer clear of the bad luck that had followed them around this year. In the first two hours Brück and Di Martino go head to head with a whole host of other cars as they fight their way through the field, until the race settles down in the second half and the German duo can safely drive to the podium.